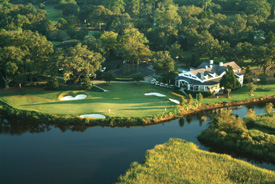 On The Green Magazine sent out a survey to our list of email subscribers to find out which golf holes were their favorites in the Myrtle Beach area. The criteria for judging was to choose the holes that gave the most golfing enjoyment. Each respondent could name up to three golf holes. Not necessarily the highest “rated” or most scenic, just the ones that they really enjoyed playing – the holes that they talked about later with their golfing buddies. The usual suspects received votes – The Dunes Club, Caledonia, Glen Dornoch, Kings North and more. The votes didn’t stick to a few well-known golf holes. Surprisingly there were 190 different holes listed as favorites. 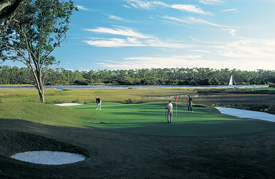 Several courses had multiple holes listed as favorites. These courses may not have “won” the contest but if 4 or 5 holes out of 18 are chosen as people’s favorites that is a course worth playing. It’s nice to have one of your 18 or 27 golf holes chosen as a favorite by somebody. It’s even better when several of your holes are chosen as favorites. 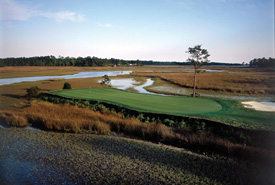 These are courses that had multiple holes chosen as a favorite by some one. The number shows the number of different holes chosen. Some of these holes have received multiple votes. How fair are these lists? Our survey wasn’t on a web site where employees could go and wear out our submit button to boost their course’s standing. If you were not on the On The Green email list you didn’t even know about this survey (an excellent reason to join our emailing list – find it near the top left side of this page). The votes were submitted by golfers who visited our web site over the years, joined our list, and receive our occasional email.